Napoleon Bonaparte was well known for leading the French as a top military commander and emperor. But did you also know that he well highly regarded for bon-a-partying as well? Yup, that's right, we've heard that this guy could have fun like no other. It is reasonable to conclude that, too, given what else we know about the military master. Apparently the shorter-than-average guy felt that it was crucial that he impress everyone so that they’d all look up to him for once. All us short folks in the world understand exactly how that feels. We’re always overcompensating for not quite attaining that perfect 6’1” Adonis look that maybe we’ve aimed for. So, it should not come as any surprise that Napoleon was one heck of a bonafide party master, too! 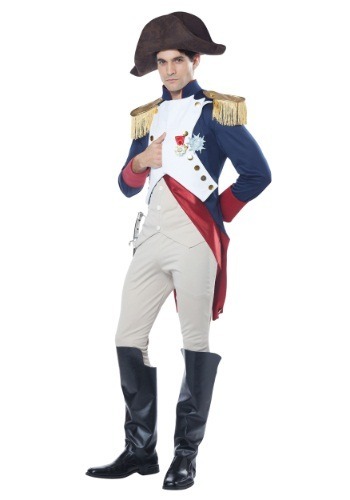 And you can see exactly what it was like in this Adult Napoleon costume when you dive into a historical throwback look. Whether you want to size up the opposition on the battlefield, or just want to survey the scene from the mezzanine level at the hottest club, you'll be able to feel like a top military commander in this detailed costume look. The red sash, award medals, and gold tasseled epaulets all create a style that commands respect. We're sure if you wear this costume to your next event, you're going to be quite the hit. And, if you aren’t, you can always pick up a few weapon accessories to make sure that your guests remember exactly who is boss! Who knows, with this fun look, you might just find a whole bunch of new recruits to join your army!